Domaine KERLANN, campsite 4 * Siblu village. 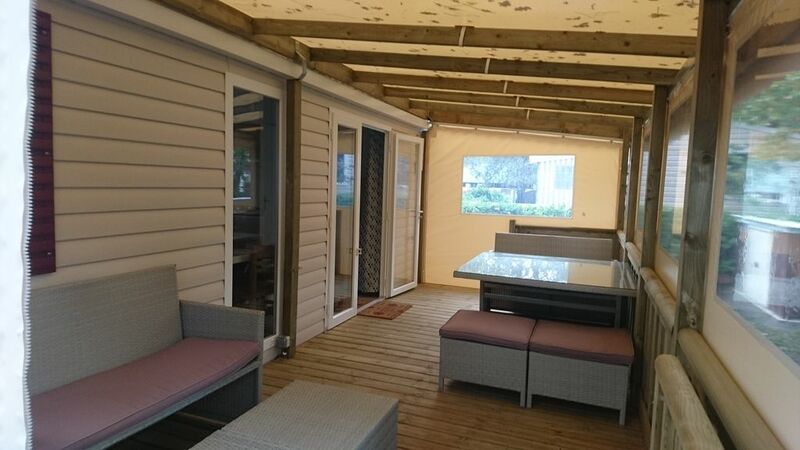 Rental of mobile home IRM Aventura year 2017 of 41m ², new, accompanied by a fully covered terrace of 16m2 ouvrable. 1 master suite with double bed 140/190, dressing room and bathroom + wc. 2 bedrooms with two single beds each and storage cupboard. Possibility of installing an umbrella bed in one of the two rooms. The living space is composed of an equipped kitchen: oven, microwave, extractor hood, coffee maker, kettle, toaster, complete crockery and complete kitchen kit; 1 living room with large corner sofa, TV and DVD player. Additional equipment: dishwasher / washing machine and vacuum cleaner. The terrace is composed of a modern garden furniture, comfortable and flexible. 2 sunbeds available to enjoy the sunshine of the plot. The terrace has two accesses, the main closed by a gate for the safety of children. Mobile home with mosquito nets and blackout. Our plot is in a dead calm and non passante, very close to the aquatic complex and animations (FUN ZONE). ON-SITE: aquatic complex (outdoor pools, spalsh area for young children, slide / indoor pool with paddling pool, jacuzzi, slide, sanitary, showers and changing rooms). Many animations, supermarket, sports hall restaurant, club children-teens, numerous spaces of play games within the park. FUN PASS nominatives guaranteeing security at the access of these infrastructures. 2 adult fun-passes and 2 fun-pass-kids offered for stays of one week minimum. Camping open from February to November (closing after the holidays of All Saints, animations for Halloween). Indoor pool open from mid-March and closed end of the holidays of the All Saints. Swimming pools heated to 31 °. Camping located 2.5 km from Pont Aven and 5km from the beaches. Provide sheets, duvet covers and pillowcases as well as linen (towels and tea towels). Provide household products and sponge. A deposit (in check for France or cash) will be required upon your arrival, during the inventory. 900.00 Euros for movable property and 80.00 Euros for the household. They will be kept, not cashed and you will be returned to the inventory of departure if everything is in conformity (general condition of the M-H inside and outside and the household). Certificate of civil liability requested. Hébergement neuf tout confort, avec une propreté impeccaple. Le camping est tout aussi génial, animations, club enfants, centre aquatique. De plus les propriétaires sont super! Je recommande fortement cette location!! Le mobile home était parfait, neuf, très fonctionnel et agréable à vivre. Nous avons été extrêmement bien accueillis et accompagnés par les propriétaires avec qui nous avons beaucoup sympathisé..
Nous recommandons très chaleureusement cette location très bien située dans le domaine, proche de toutes les activités . Nous sommes tellement ravis de notre séjour que nous souhaitons relouer ce même mobile home l’année prochaine..!!! Merci encore aux propriétaires pour leur superbe accueil et la qualité et le soin apporté à leur mobile home.